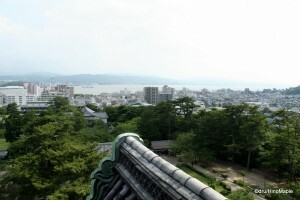 Matsue is a nice small city located near the coast of the Sea of Japan, north of Okayama. 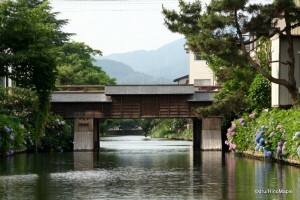 It is a little different from typical small towns located along the Shinkansen due to the lack of easy access points. The entire region of Shimane is similar to each other. The city of Matsue is great for its ability to have all of the amenities of a modern city, and the friendliness of a small town. It is not a major tourist destination, even for Japanese people, but it is very friendly to foreign tourists who are looking to experience small town Japan. There are a lot of things to do in Matsue. The main attraction has to be Matsue Castle. It is one of the largest landmarks in the area, and a great base for a day full of exploration. Upon entering the temple grounds, you will realize that the entire castle area is much smaller than other castles such as Himeji. On the grounds, the first thing to see would have to be the Matsue Jinja. 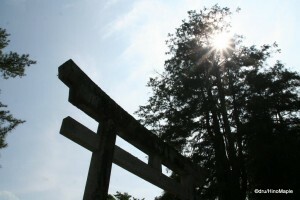 It is a very small shrine that is within the castle grounds, but below the castle itself. It isn’t a significant shrine, but it is picturesque enough to warrant a picture. 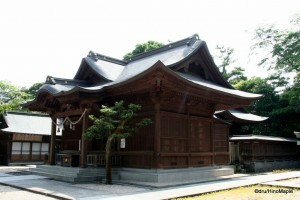 Next to the shrine is the Matsue Kyodo-kan. It is a European style building with a small, and free, museum inside. Inside the museum, you can see a few miniature models of the city showcasing the city around the start of the automobile era. It’s nice to see, but a little cramped within the exhibits. Unfortunately, I didn’t get a chance to head upstairs, but there are more exhibits there as well. A more interesting place to visit would have to be one of the guard towers located a stone throw away from the Kyodo-kan. Inside the tower, you will be greeted by typical castle architecture. Think of it as a mini-castle where you can enjoy yourself with relatively few people to disturb you. I enjoyed it almost as much as the castle, mainly because there was only one other person inside. Matsue Castle itself is a mid-sized castle. 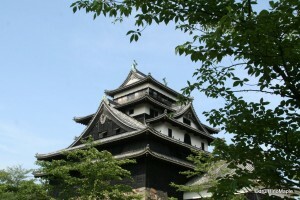 It is an original black Japanese castle. 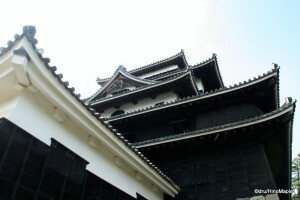 In Japan, there are two varieties of castles, white and black. Himeji is a typical example of a white castle, which is predominantly white, and Matsue is a black castle, which is predominantly black. The area around the castle is also nice, but inside you will be greeted by the original architecture. One of the original water wells are still there and open, but covered by chicken wire to keep people from falling in. Like most castles, you will be able to get a taste of the old life in Matsue. You can see old traditional samurai armour, pictures of castles from around Japan, and miniature scale models of Matsue itself in both the past and modern times. What caught my interest the most were the old wooden partitions with paintings of daily life activities on them. It was somewhat unique in the area and worth a few extra minutes to enjoy. The castle keep itself was not special. Most castle keeps in Japan are just open spaces with beautiful views. While the view of Lake Shinji was beautiful, the other sides were not as spectacular as you mainly saw the modern buildings of Matsue. Unlike Kochi, you didn’t have a sense of the old life, or the beauty of nature just outside the city as you couldn’t really see past the buildings. Generally it’s still a fun place to visit, and do spend a little time to go around the entire castle grounds as you can see different aspects of the history of castle construction as you do so. For Japanese tourists, a trip to the northern side of Matsue Castle is a must. 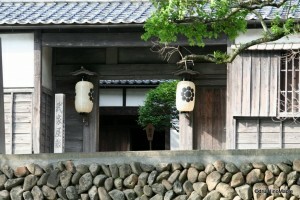 Buke Yashiki, or the samurai residence, is a small section that houses the old home of the top level samurai of the region. The home itself was not as grand or lavish as some of the other samurai homes that still exist, due to the low salary of a samurai in Matsue. If anything, the entire area is worth a visit for the ability to look around and see how the samurai lived and how people in general lived at that time. Next to the Buke Yashiki is the Lafcadio Hearn’s Old Residence. This is an old house that housed one of the first foreign residents of Matsue. He went on to become a naturalized Japanese citizen and wrote many books on Japan. He is usually credited with introducing Japan to the western world, but his works tended to over romanticize the country. He only spent a little time in Matsue, but he was remembered the most by the people in Matsue. The best thing to do in Matsue is to take a boat cruise. There are several small and long boats that ply the waters of the castle moat and the old moat system around the city. One circuit will take roughly 40 minutes. The boats themselves are fun to ride and you pass under very low bridges at times. You have to be a little careful as the roof of the boat actually lowers, forcing you to bend over and nearly touch your head to your knees. Thankfully, when I took the tour, I was with one other person, so we could just lie down and relax sprawled out on the floor rather than contorting our bodies in a somewhat unnatural way. The trip will take you under various new and old bridges and past various historical and important modern buildings. The guide will point out all of the important places, including telling you of the different bridges you pass by and under, but all of it will be in Japanese. Thankfully, you can get a little enka music played when there is nothing special to listen to. The guide is also interesting as they dress in white cotton pants, a blue jacket that is similar to a “happi” that is worn during festivals. The guides also wear rice hats as if they were in Vietnam. If you have the time, you can hop on and off of the boat and various points. I had been recommended to visit the Ji Beer Kan, which is a micro brew shop in Matsue. The beer is supposed to be delicious, but unfortunately, I didn’t have a chance to go. The last thing to do is to head to Lake Shinji. It is a famous lake in Shimane and the major obstacle between Izumo and Matsue. It is famous for its small clams, the Shijimi. In Matsue, you can purchase the shells of the Shijimi, and also the clams themselves. They are great inside miso soup, but do be aware that as with all other forms of seafood, it’s probably not allowed for importation in your own country. I would consider just buying some miso soup which would probably come with some Shijimi. The lake itself, from Matsue, is well known for its sunset. There are a few sunset tours, but a view from the park is probably best. If you head out of the station, head west along the street just north of the station and you will reach the park in roughly 15 minutes. It would mark a great end of the day to anyone’s tour of Matsue. Matsue is such a beautiful place that needs at least a day to explore. There is a lot you can see and do if you have the time. You can either rush and see many things in a short time, or take your time and see everything at a slow pace. I always prefer the slow paced approach. If you do have the time, rent a car and head out for a drive around Shinji Lake. You won’t be disappointed. This entry was posted in Chugoku and tagged boat cruise, Buke Yashiki, Izumo, japan, Ji Beer Kan, Jinjiko, Kochi, Lafcadio Hearn, Lafcadio Hearn's Old Residence, Lake Shinji, Matsue, Matsue Castle, Matsue Kyodo-kan, Matsue-jo, Matsuejinja, Okayama, samurai, samurai residence, San'in, Sea of Japan, Shimane, Shinjiko, Shinjinoko, Shinkansen, 出雲, 宍道湖, 岡山, 新幹線, 日本, 日本海, 松枝, 松枝神社, 松江城, 高知 by Dru. Bookmark the permalink.